The Trump administration says it will permit a Palestinian official known for endorsing terrorism and murder to enter the United States next week for a series of high-level meetings on the Israel-Palestinian peace process, a move likely to prompt outrage in the pro-Israel community. The State Department confirmed to the Washington Free Beacon late Thursday that it intends to permit Jibril Rajoub, secretary of the Fatah Central Committee, to participate in meetings with U.S. officials next week, despite his repeated calls for terrorism against Israel and a 15-year stint in Israeli prison for committing terror acts. A State Department official who spoke to the Free Beacon acknowledged Rajoub's radical rhetoric, but maintained he can serve a positive role in peace talks set to take place between Trump administration officials and a Palestinian delegation including Mahmoud Abbas. Pro-Israel organizations and victims of Palestinian terror attacks already have called on Secretary of State Rex Tillerson to bar Rajoub from entering the United States due to his calls for terrorism. Legal experts claim that Rajoub's endorsement of terrorism should prevent him from obtaining a U.S. visa under current laws. U.S. law bars entrance to individuals who "endorse or espouse terrorist activity." The Trump administration has no plans to acquiesce to this call, according to a State Department spokesman. "The U.S. government does not endorse every statement Mr. Rajoub has made, but he has long been involved in Middle East peace efforts, and has publicly supported a peaceful, non-violent solution to the Israeli-Palestinian conflict," the official told the Free Beacon. "We continue to press Fatah officials, including Rajoub himself, to refrain from any statements or actions that could be viewed as inciting or legitimizing others use of violence." Rajoub can play a key role in advancing peace talks, according to the official, who maintained the Trump administration is "committed to reaching a comprehensive Middle East peace agreement." "As part of that effort," the official said, "administration officials have been meeting with a range of both Israeli and Palestinian officials, including Rajoub." 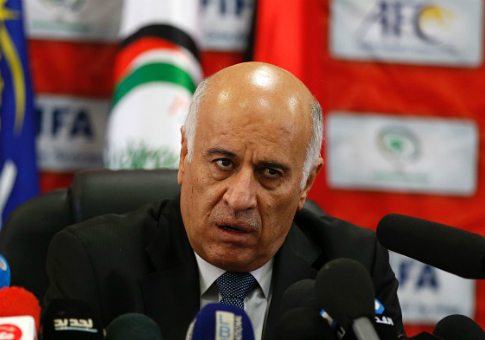 Pro-Israel advocates have long denounced Rajoub for his repeated endorsement of Palestinian terror acts and efforts to glorify those who commit them. Rajoub was sentenced in 1970 to life in prison for throwing a grenade at an Israeli Army truck. He served 15 years in prison, but was released in a 1985 prisoner exchange. Rajoub praised Palestinian terrorists who targeted Israeli civilians in the most recent wave of violence. "We in the Fatah movement bless and encourage them," Rajoub said, according to Palestinian Media Watch, or PMW, a group that monitors Palestinian rhetoric. "We consider them heroes and a crown on the head of every Palestinian." At least four Americans were victimized by terror attacks following Rajoub's statements, according to PMW. When terrorism against Israelis spiked in 2015, Rajoub appeared on official Palestinian television to endorse the crimes. "These are individual acts of bravery, and I am proud of them," Rajoub said on television in October 2015. "I congratulate everyone who carried them out. I say to you, we are proud of you … Whoever confronts, fights, dies as a Martyr, is arrested or injured—his identity is known. What I mean is that the fighter, the prisoner, or the Martyr, they are assets to the entire Palestinian people." Rajoub repeated this statement in a separate interview in January 2016. "I say that whoever carried out individual acts of heroism, we in the Fatah movement bless and encourage them. We consider them heroes and a crown on the head of every Palestinian," he was quoted as saying. Rajoub also has come out in favor of Hamas' kidnapping Israeli soldiers. "If Hamas wants to kidnap soldiers, let them kidnap soldiers," he said in a 2014 interview. U.S. law appears to bar entry for individuals who engage in this type of rhetoric. Anyone who "endorses or espouses terrorist activity or persuades others to endorse or espouse terrorist activity or support a terrorist organization" should not be permitted to enter the country, according to current law. Those opposing Rahoub's entry into the country have already established a website publicizing his statements and calling on Trump to intervene. Nitsana Darshan-Leitner, president of the Israel Law Center, said in a statement that Rajoub should not be heralded as a partner for peace. "Rajoub is an unrepentant terrorist who has never abandoned his dreams of murdering Israelis," Darshan-Leitner said. "At every opportunity Rajoub publicly vows that he will eventually destroy the State of Israel. Allowing this recidivist criminal, who has served numerous jail terms, to enter the U.S. would create a threat to the public safety of all Americans." "Secretary Tillerson is urged to bar the entry of this dangerous thug and to send a message to the PLO and all other terror groups that under this new administration the U.S. will no longer be a safe-haven for violent extremists who have declared war against the West," she said. This entry was posted in National Security and tagged Israel, Trump Administration. Bookmark the permalink.